What is it about people today that writing to say “thanks” is too much work? It seems the least one can do in return for a gift, a dinner, a night out, a sales order, or a visit. 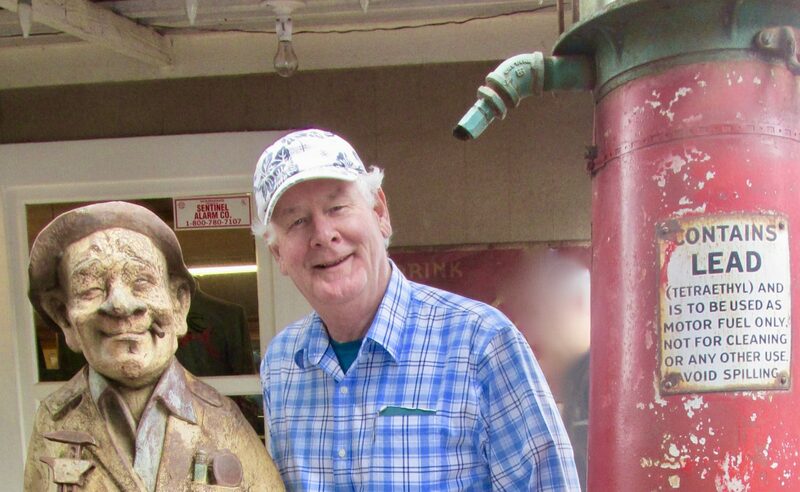 Here is the story of one thank you worth noting. 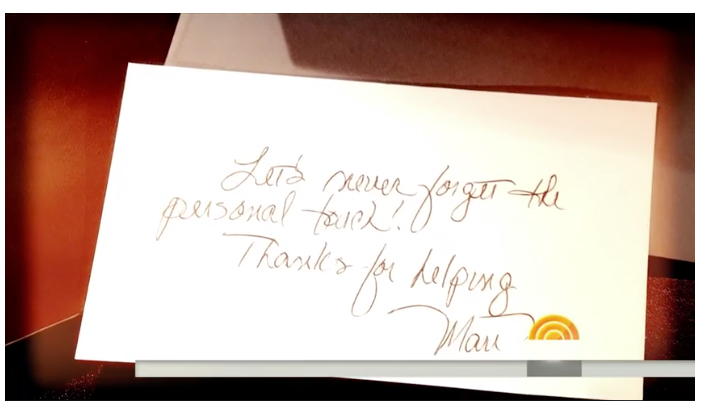 My frustration is really a hat tip and compliment to NBC’s Today Show host Matt Lauer. 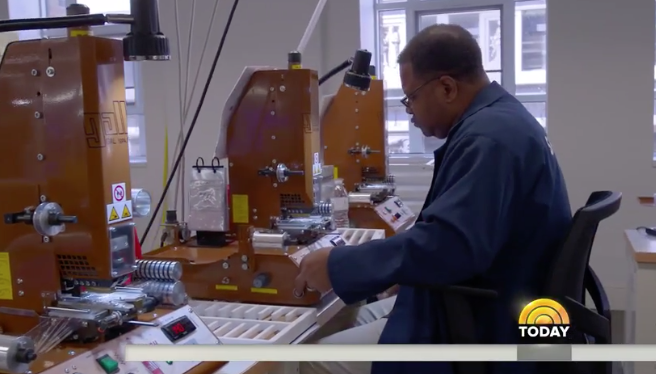 You may have seen his visit to the blooming Shinola factory in Detroit. There, dedicated folks are building a little industry in journals, greeting cards, thank you notes, day planners and personal calendars. Mr. Lauer’s interest in Shinola is twofold. First he is supporting entrepreneurial growth in one of the toughest and long abandoned districts of Detroit. The streets are bordered by broken homes and derelict factory buildings. Homeless denizens still occupy the corners of doorways. 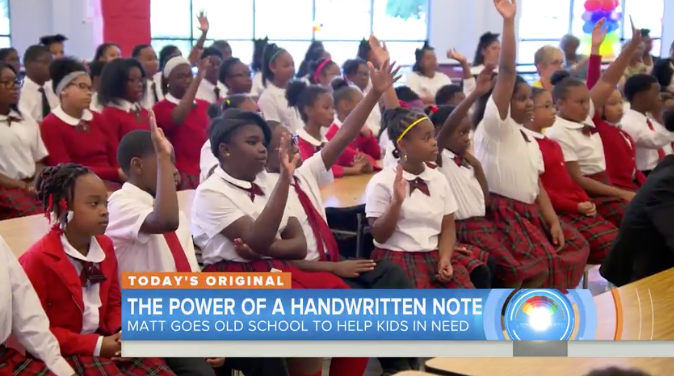 Despite that, there is The Detroit Edison Academy, an elementary school nearby where uniformed children are taking on the challenges of learning and self reliance with optimism. 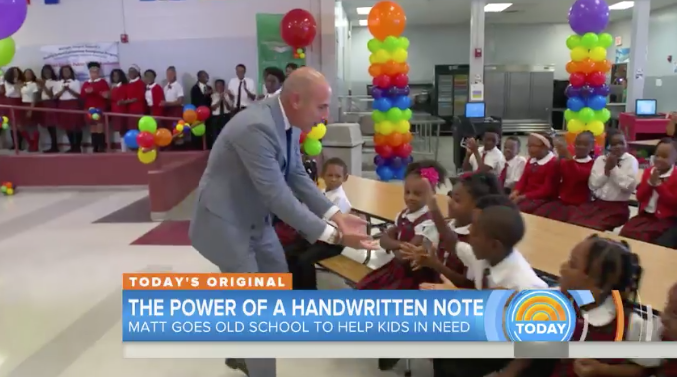 Matt Lauer cheers on the D-E kids. Lauer’s gift to the school are the profits derived from Shinola’s sale of his personalized product line. All part of the comeback process for urban Detroit. 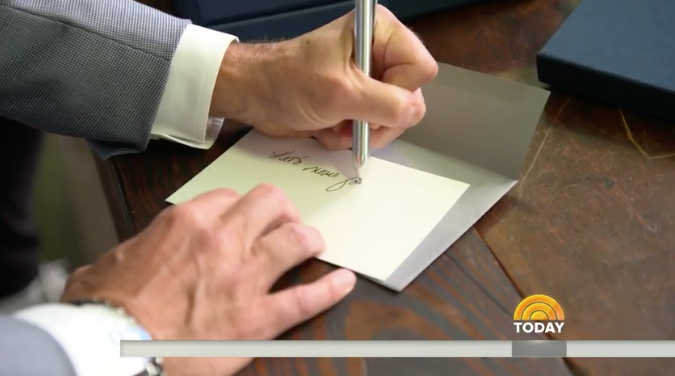 Lauer’s other pursuit is the rebirth of the hand written note. 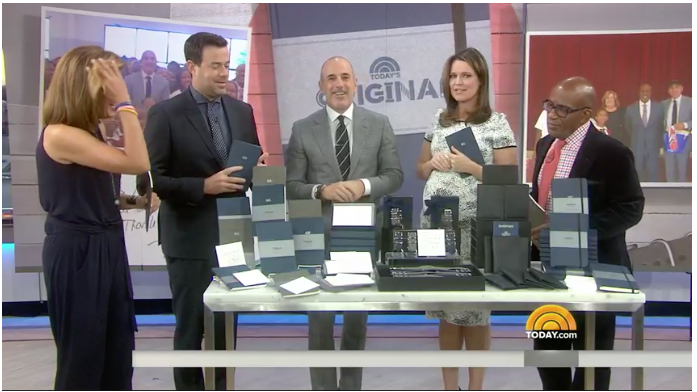 Matt and the Today Show crew viewing his personal line of Shinola journals. Profits go to Detroit Edison Academy. Shinola’s Detroit product line extends beyond leather and linen covered booklets to precision watches. The combination of the two products appeals to an array of sophisticated and enlightened consumers. The production lines are the breeding ground for devoted, and motivated workers clad in smocks and dust free head covers. 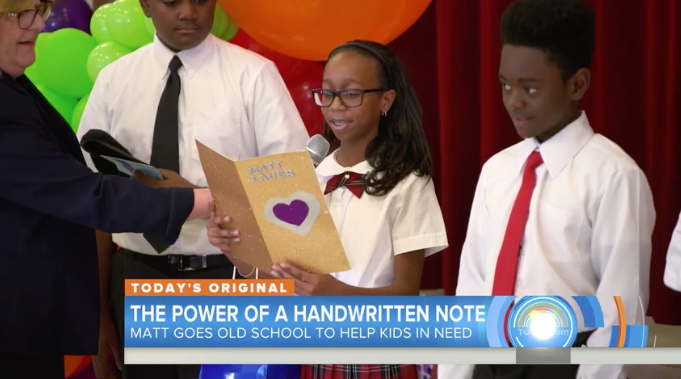 The D-E students present Matt with their hand written cards of thanks. Detroit Edison Academy looks like an oasis in the middle of an urban desert. Its hallways are clean and bright, and teeming with good looking, tidy kids on their way to a better future. They cheer Matt later for his support, and in a presentation, thank him with a bounty of hand written cards. Lauer is overcome. “Thank you. This means so much to me. I am one of those believers who still write someone a little note… when was the last time you went to a mail box and found a letter that was addressed to you? Isn’t it a special feeling? Thanks for sharing! You can watch this really cool video of Matt’s visit here. 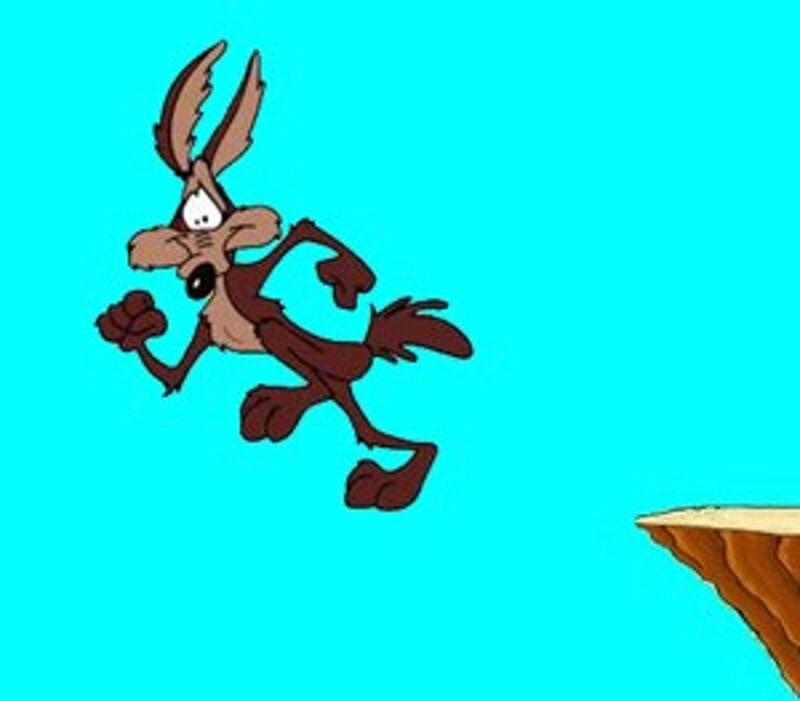 You know the Wiley Coyote scene where he runs off the cliff in hot pursuit of the Roadrunner. There, hung in blind suspension of disbelief, he looks at the camera before reality sinks in. Then he falls with a vviipp or a boink. 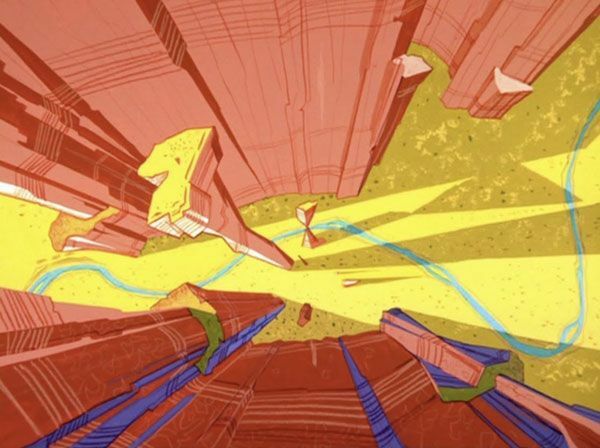 We chuckle happily at his dusty, bruised remains in the canyon below. So it is that I now admit to a similar, sad and painful realization. Last December 6 I advised you that despite the falling volumes of the post office, one thing blossomed like a fresh spring crocus on a sunny hill… our continued, warm-hearted custom of sending greeting cards. Christmas, Hannukah, Thanksgiving, Halloween were all good reasons to pick up our pens and write. I detailed in colorful charts how “Single Piece Cards and Letters” sky-rocketed in the last quarter of the year, from October to December. Poring over the figures from the regular USPS reports, I found that the numbers went up, even while general mail volumes went down. It was, as I said, revealing our brighter side. 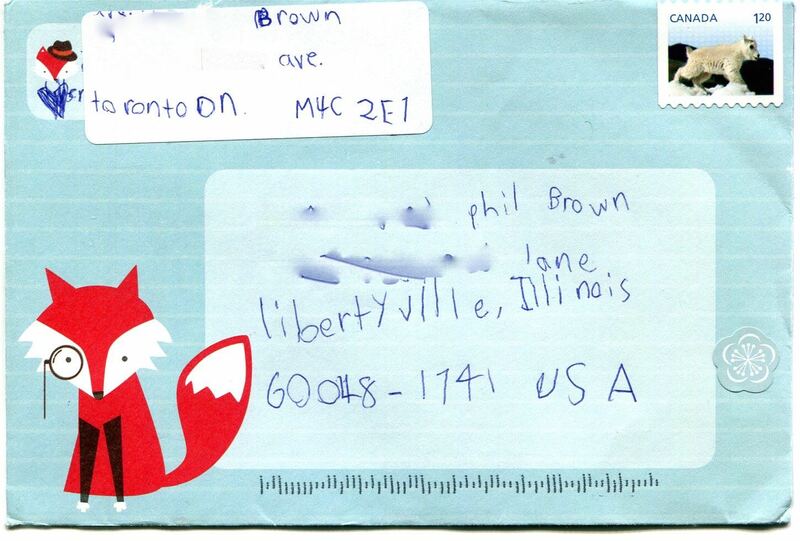 Mail may be an antiquity, but by golly, we are sending a card anyway. Revisiting that article, I discovered to my shock and dismay, that I had reported on revenues, not pieces. Aaarrrggghh! Yes, patient reader, I misled you, big time. The truth is, Cards and Letters for Q4, October 1-December 31, remain virtually the same share of the total, for the years 2004 and 2014— 27.5% to 27.7%. Meanwhile the whole category tumbled 55% over ten years. Do they jump up in the last quarter as our good intentions begin to materialize? Yes, as always. In 2004, an uptick of 18%, and 2014, up 22%, just in time to make delivery by Christmas. But who’s going to calibrate a blip…a minor swelling…a mild burp in goodwill based on these numbers? The fact is, we have laid down our pens. 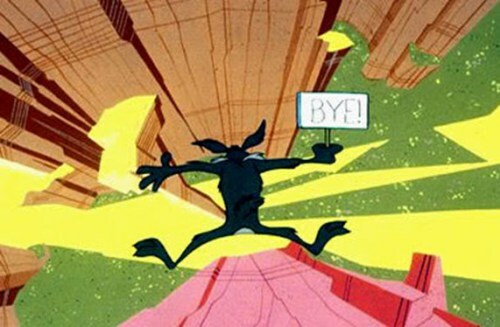 With that, Wiley Coyote looks down into the abyss. In his descent, he contemplates what went wrong. Yes, email for sure. Good grief, why send a thank you card for a dinner when a two-liner on Gmail will tick that off the list? 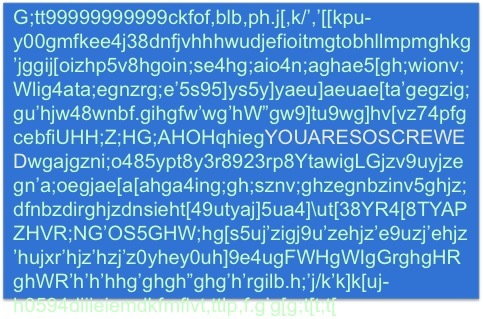 Want to bang off a birthday greeting fast? Hit “send” and it’s done. And is there any need to spin post card carousels in some tourist trap when you can celebrate your vacation on Facebook? Hardly. And so much for mailing pics of the Grandkids when there’s Instagram. The physical delivery of the letter made a big, personal-brand impact. When someone took the time to compose, and write, in ink, on a nice card, address and lick an envelope, buy a pretty stamp, and find a mail box, it communicated in ways far beyond digital. From the time that they could open mail, I have written notes and cards to our grand children. The goal was to accustom them to the excitement and anticipation that accompanies a successful trip to the mail box. A real letter will always prevail over an electronic communication with the same content. Like a personal gift, it eclipses any email. 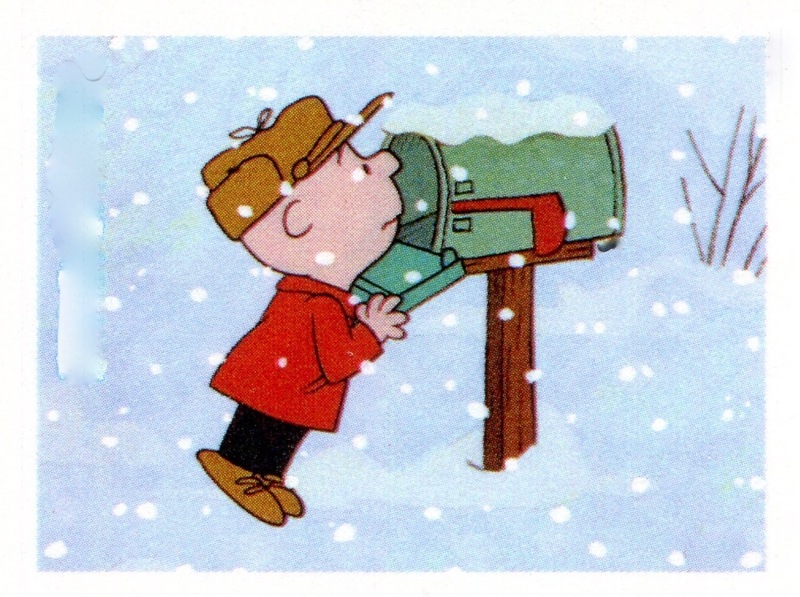 Granted, the mail box delivers direct mail too, and some may object. But compare a couple letters, catalogs and cards a day versus an earful of robo calls, or endless repeat ads on TV, and nervous, persistent popups on your favorite website, and you are prepared to give the mail man, or mail lady, a pass. In the social media arena, the email medium has a dark side, which I blundered into this week. It started when scanning my email folders, I found that I had collected some spam. I opened the “junk” folder to find a stern notice summoning me to a court hearing next week. The subject line was ominous: County Court Summons. Like a total rube, I opened the email for details. It announced that I had been summoned by a named county court officer to appear March 25. I was advised that in my absence, the court would proceed with actions as described in the official court document attached. When I did, the computer screen flooded with a thousand lines of code. More characters than a kanji encyclopedia scrolled before my bedazzled eyes. In a panic, I punched keys left and right, closing the file, and dove under the desk for the power cord, to rip the laptop off the grid. Returning to the spam folder, I found another foreboding greeting, this one from E-Z-Pass toll collections warning me to pay off past due charges immediately. Much wiser now, I did not open the Official Billing Notice attached. I had been duped by the brusk, official look of the email, and should have recognized the ruse immediately. Email builds its own insensitivities. We are more disposed to ignore it, or save it never to read later. It’s a casual, low calorie communication. Conversely, without thinking, we may dive right in like I did, and open it, only to poke a bees’ nest. The real deal: Federal property carrying real value. Regular postal mail requires much more attention, both by the writer, and the receiver. The fact that postal mail is a Federal government enterprise, armed with regs that have brought many a crook to jail, gives me great comfort. Esthetically, there is enormous value in every personal letter, because it’s a perfect indicator of care, concern and thoughtfulness. 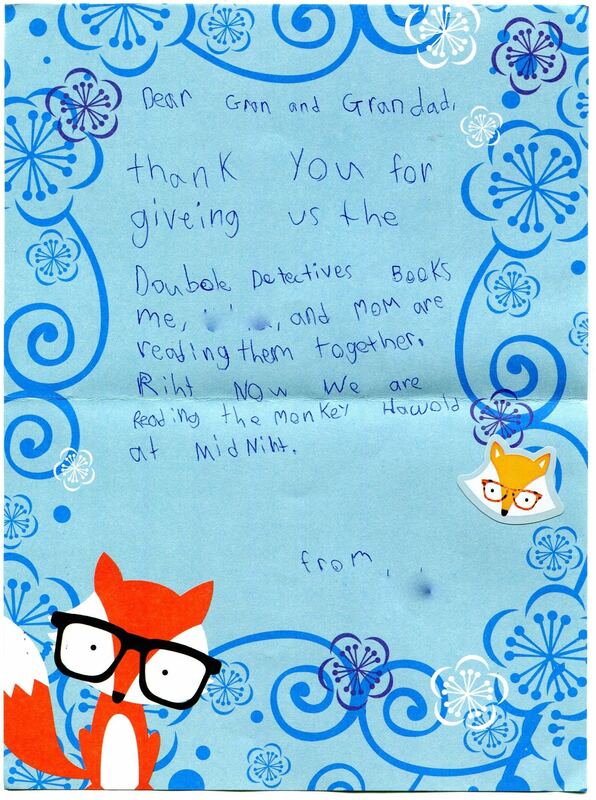 We feel good opening a letter, and just as good writing them. So I continue my efforts on peppering the grandkids with real letter mail, printed on paper, much in the tradition of my own grand parents, hoping that one day, they will get the bug. It’s slower, physical, and more thoughtful. And who knows, maybe just one day, what goes around will come around. Every year the media touts the headline that the United States Postal Service lost another few billion dollars. Politicians get huffy. The digerati are quick to call the funeral home. But in fact, the USPS has accomplished an amazing business coup in its mail delivery management. First, look at the current “bad news” available in the latest Revenue, Pieces and Weights report* for USPS full year 2014. Figure 1 gives some highlights. Fig.1. 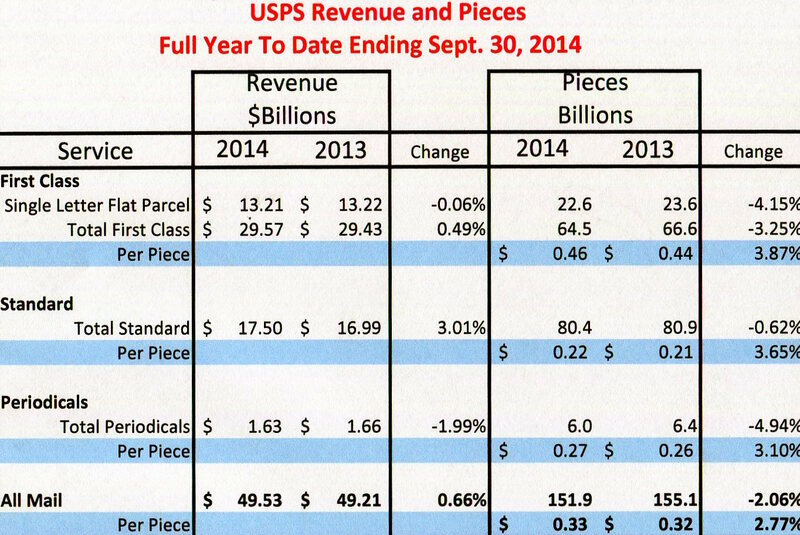 2014 mail revenues were up 0.66% to $49.53B while mail volume fell 2.06% to 151.9B. Mail volumes decreased from 2013 to 2014. A 2.06% decrease to 151.9 Billion pieces. “Pieces” include letters, parcels, magazines and flats. The shrinkage may be attributed, if you wish, to a blended increase in price (postage) from 32 cents to 33 cents per piece. A 2.77% increase. But it probably has more to do with society’s use of email. We would just as soon email Gran a singing birthday gift card as send her a parcel. Dig deeper and we find that First Class volume shrank 3.25% while actual revenues increased 0.49%. What we know about mailing economics is that there is no elasticity. When postage goes up, volume goes down. This is the fundamental truth of direct mailers. They maximize performance through testing list, offer, format and copy. The best performance becomes the economics benchmark. So when Standard Postage goes up 3.65%, we expect some mail to drop out, which it did: 0.62% less. November 14, the USPS presented its preliminary financial results to the Board of Governors. It declared a $5.5 billion loss in income. That made headlines. What was not picked up however, was its mail operations performance. You see, its operations income was $1.4Billion profit. What that means is that the USPS moved nearly 152 billion pieces across the country to over 140 million addresses, six days a week, and did better than break even. What was the all-in price per piece to the mailer? 33 cents. Now lets look at the real miracle of the USPS by comparing 2014 with 2004. Ten years ago, it delivered 206 billion pieces for $65.87 billion. Cost back then? 32 cents each. Not bad! A one-cent increase in 10 years. Despite a 26% decrease in economies of scale, its performance eroded only by a penny. This does not begin to recognize the efficiencies the USPS has managed to achieve in the last ten years however. It disregards the massive cutbacks in volume, and the inexorable devaluation of the dollar. Look at the 2004 figures when they are expressed in 2014 dollars. See Figure 2. 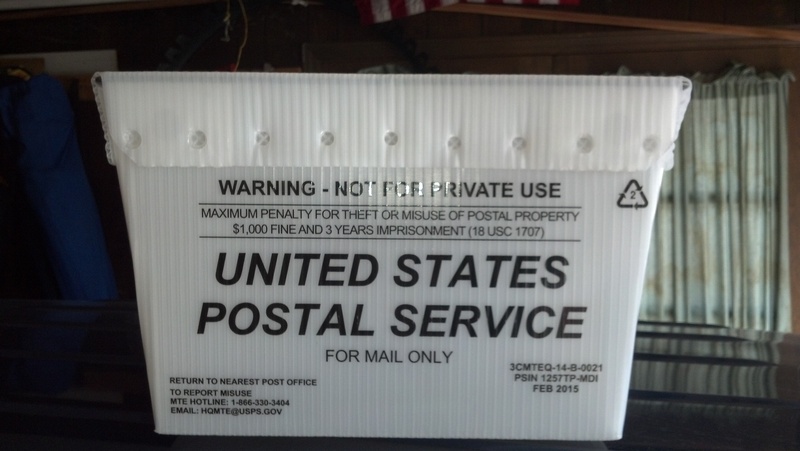 Fig.2 Using 2014 dollars it cost 40 cents to a mail a piece in 2004, versus 33 cents today. According to the US Bureau of Labor, we have experienced a 26% increase in prices. In other words, it takes $1.26 today to purchase what $1.00 would buy in 2004. 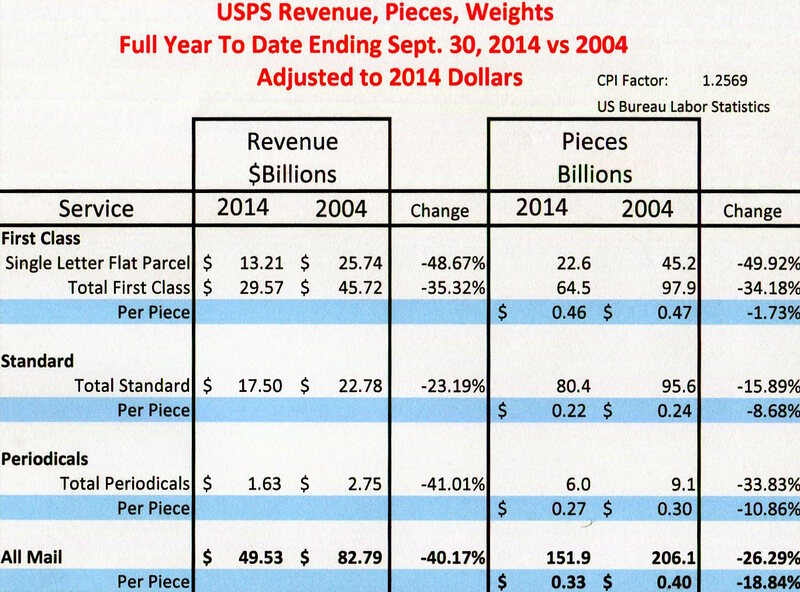 Applying the CPI to USPS figures then, we find that in 2004, it cost 40 cents to mail a piece, versus 33 cents today. Standard Mailers would pay 24 cents in 2004 versus 22 cents today. First Class mailers would pay 47 cents, versus 46 cents today. Magazines: 30 cents then, 27 cents now. This government agency may have its critics. The oracles may claim that mail is antiquated. But they can hardly explain how well the post office has learned to distribute real property coast to coast at ridiculously low cost to the consumer. Email and Internet may be instantaneous, but they both lack the credibility of hard copy delivered under government seal. It can be said that mail is slow, but it maintains its cache because it is trusted. We need to acknowledge the effort that the USPS has expended to bring us that service.